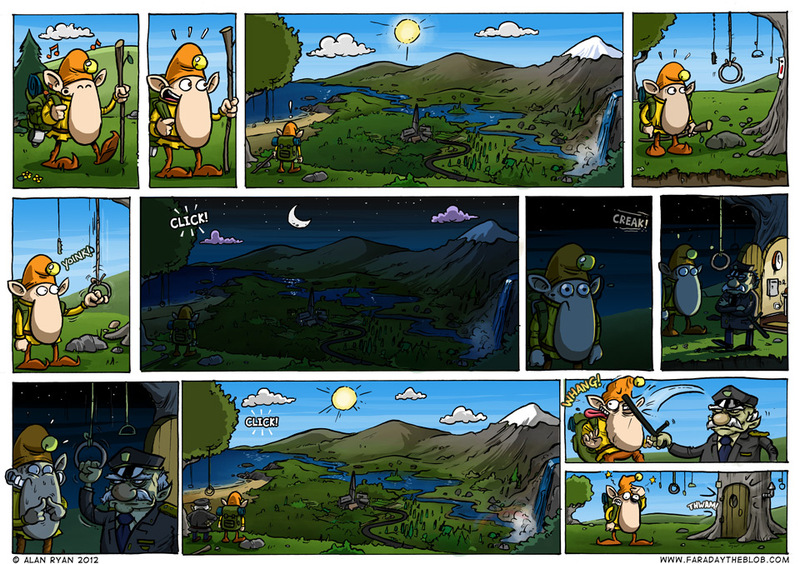 A moment’s silence please, for this week Calamities of Nature, one of my favourite webcomics of the last few years, was retired gracefully by its creator due to the pressures of real life and career. Even though it was becoming increasingly esoteric recently, it was always essential reading and will be sorely missed. You can check out my Calamities guest strip here. This entry was posted on Tuesday, March 20th, 2012 at 1:50 am and is filed under Comics. You can follow any responses to this entry through the RSS 2.0 feed. You can skip to the end and leave a response. Pinging is currently not allowed. But what do the other pullies do?!?! I love the kind of casually absurd/surreal world that they live in. Beautifully drawn, and inspiring. Now I’ll have to start tugging on tree branches to see what happens. NKH - Man, I’d love to know that too. I’m a big fan of those tantalising little details in comics/books/movies that extend the story/world beyond the main narrative. Antoine - Wordless comics are great – I love when the opportunity to do one comes along. Justin - Cheers, don’t tug too hard though – squirrels! Ha, love this one – and beautifully drawn too.